HOLLYWOOD, Md., June 12, 2009 -- Northrop Grumman Corporation (NYSE:NOC) recently presented St. Mary's County Public Schools with a $5,000 sponsorship for its Science, Technology, Engineering, and Mathematics (STEM) program. The $5,000 sponsorship will support STEM program participation by more than 250 elementary through high school students, as well as numerous other students across the school system who benefit from STEM instruction in extended day programs and summer camps. 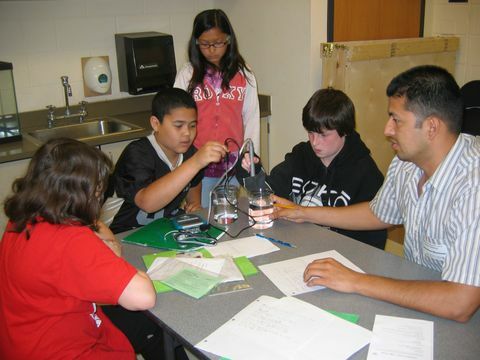 STEM emphasizes the core areas of mathematics and science with an infusion of technology and engineering. Students with advanced skills and interests in these areas of study receive instruction in state-of-the-art classrooms, research laboratories and e-learning labs. "Northrop Grumman is a corporation recognized for its technological innovation and commitment to the communities where its employees live and work," said Scott Stewart, Northrop Grumman corporate lead executive in Patuxent River, Md. "We are proud to support initiatives like the STEM program. There is nothing more important than helping the local school system and community provide the young minds of today with the opportunity to realize their potential as they become the leaders of tomorrow." With almost 300 employees in the area, Northrop Grumman is an active part of the community. Recently, Northrop Grumman employees from the Hollywood, Md., site had the opportunity to take some time out from their usual work routine and spend time with two fifth grade STEM classes at Lexington Park Elementary School while they devised their end-of-the-year science experiments, revolving around weather science. The experience had an impact on both the students and the Northrop Grumman employees. "Northrop Grumman has embraced programs like STEM as a way to give back to our communities and empower young people with the realization that they can be anything they want to be," said Mike Kibler, Northrop Grumman STEM coordinator for the Pax River area. "Northrop Grumman's sponsorship of St. Mary's County Public Schools STEM program has allowed us to make a greater impact on the learning that takes place in our schools each day," said Dr. Michael Martirano, superintendent of schools. "Both their financial sponsorship and their participation in our STEM student's activities will help St. Mary's County Public Schools move toward our goal of incorporating an enhanced program in the areas of Science, Technology, Engineering and Mathematics for all students."